As I'm sure you've noticed, I've been updating this blog very sporadically for the last couple of years. I even described it as being on semi-hiatus in a few blog threads on forums and other communities. I suppose excuse number one is that I haven't been buying a lot of new clothes or make-up for the past few years as I've been what-I-call 'sporadically employed'. However, I have still bought a few bits from charity shops and I have received some hand-me-ups from my sister. And this excuse really shouldn't fly for the person who wrote post after post about reworking your wardrobe and followed Tricia's wardrobe remix posts religiously back in the day! Excuse number two is that I've been focusing on my book blog, and it has paid off as I now have actual followers over there. But, I actually still have about three times as many subscribers to this blog! I have a whole audience I've been neglecting. Excuse number three, which is slightly true, is that I've been really busy: firstly with my MA, then with job hunting and volunteering. But the truth is I haven't made time for it. I think it's a confidence issue. I know this sounds like pretentious nonsense, but when I started, there really weren't that many fashion blogs. I'm sure that when I started using Google Reader, I subscribed to less than a dozen. There were certainly only a couple of alternative fashion blogs out there. If I'd kept posting multiple times a week and put the effort in then maybe my blog would be really well known now! But truth is, I never had that much confidence in my ability to opine on the fashion world. So when I became busy for a while, I let it go, finding it too difficult, with everything else going on in my life, to keep battling the fear and keep posting. And then all these other people came along and made it look so effortless, and it took me a while to get over that. Fashion and style is such a personal topic, and I was only just discovering how much fun clothes could be when I started blogging. Happily, now I'm pretty set in my self-assured ways. But there are still things to learn, and to think about. A lot of blogs are all about the hauling and shiny new stuff now, and I got sucked into reading a lot of make-up blogs and bookmarking loads of reviews in my 'lemming' folder. But I still advocate not going to the shops/looking at online stores as the best way to save money and force yourself to think creatively about the clothes you already own. So maybe my niche is still there, waiting. Only one way to find out, and I've been wanting to for a while. Selina of Flying Saucer, one of those half-dozen or so blogs I originally subscribed to and still enjoy even though her style is so different now from mine (No body-con dresses for me. Floaty for life!) is running a 31 Day challenge for May, so I thought, might as well! Day 1's theme is: My Wardrobe. I have two. One for normal length tops and one for long tops, skirts, trousers and dresses. Both have a shelf above the hanging space. 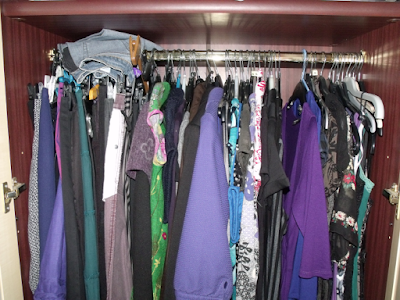 The normal length tops wardrobe (above) also has three drawers, filled with tights, knickers, pyjamas, socks, vests and various rarely-worn stuff. Some of which is crap I should really get rid of, but I just haven't been able to bring myself to donate. For example, the spray-paint-and-glitter effect jeans I got when I was about 14, and thought would make me look like such a rock star. I don't think I even wore them out of the house before they went completely out of fashion, probably forever! I expect they're much too short for me now as well. What am I doing. Bras are in a separate drawer unit. They were originally in the drawer with knickers and tights but then my collection of tights got so large I had to move them out and squish them into one of my tiny bedside drawers. More on the tights tomorrow. The normal length tops wardrobe is alright, you know, apart from the whole hoisery addiction thing (in the photo above you can see two pairs still in their packaging - I have at least three more pairs that are entirely unworn in the drawers or on top of them) but the long tops wardrobe is dire. Now, I know you're thinking, that looks much less crowded. But you can't see the shelf above. Or the floor. The floor contains my shoe rack, loads of bags, a magazine rack holding all my precious copies of J-17 magazine, and loads of wrapping paper from Christmas that I aim to reuse. And I don't even mean that it's from just this Christmas. Oh no. Some of it is from the year before. Plus one of my dresses has clearly been falling off the hanger, again. But I don't want to focus on the negatives. 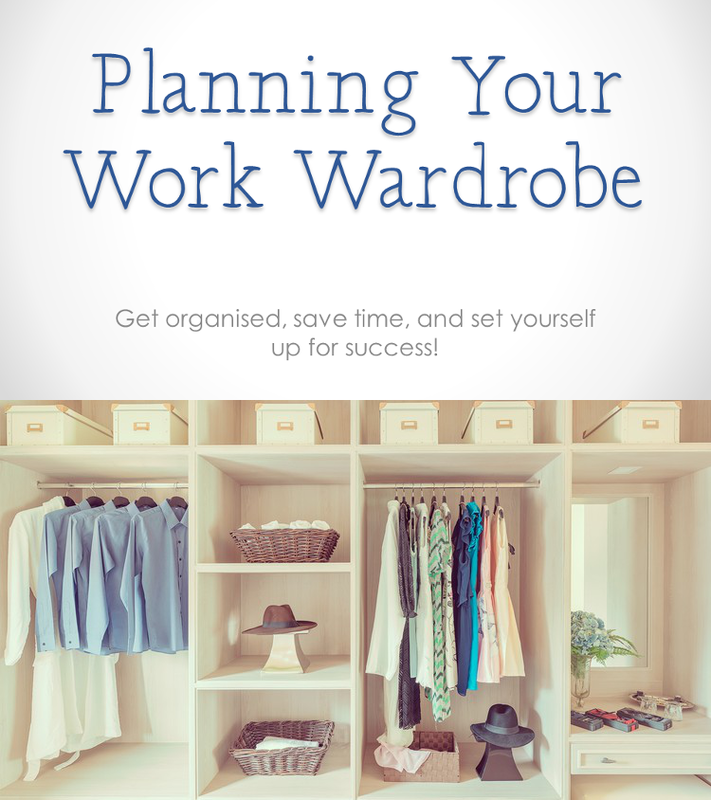 Although there is a lot of crap I need to sort out/get rid of (e.g.. the spray paint trousers), my wardrobes are otherwise quite organised. Skirts are hung in order of size, shortest to largest. 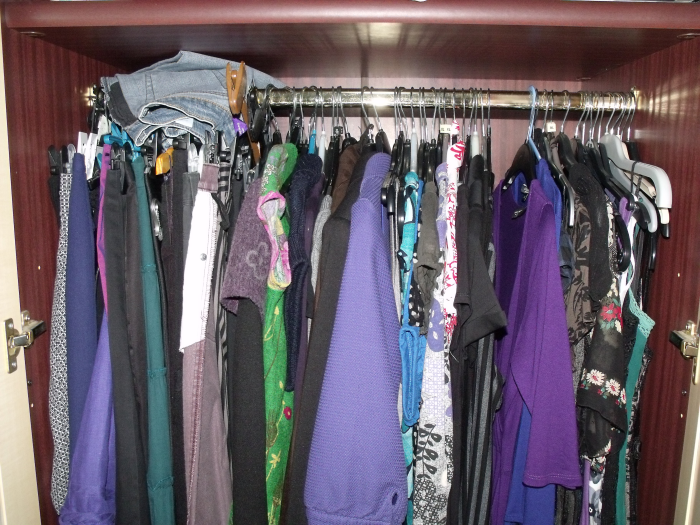 Then I've hung all the trousers, followed by long tops, dresses that can be worn as tops, dresses I can wear any time, and finally on the right are all the summer-only dresses that are too easily creased to be folded up and store in boxes (on top of the wardrobes) during the winter. I also have a really long evening dress in the middle. All the longest items are supposed to hang towards the middle so that I can put stuff on the floor and up against the sides of the wardrobe. The normal-length tops wardrobe is in sections: cardigans/jumpers, collared shirts, long sleeved tops, short sleeved tops/t-shirts, and strappy tops. It's also organised by colour within those sections. I used to have it organised just by colour but I couldn't find things efficiently enough! Maybe these photos will serve as a 'before', and will remind me to get working on clearing them out. There are so many things I'd like to rehome. I'd love to have a more cohesive theme to my wardrobe, but at the same time, I enjoy the eclectic range. Most days, I want to dress in my typical purple-goth manner. But others, I just really want to wear a brightly-coloured long top and some jeans. Hopefully I'll be posting about tights tomorrow - the thing I have the most of! Good luck sorting out your wardrobe and hope to see more posts! My wardrobe goes (roughly) Ball gowns, smart party dresses, coats, work clothes, smart/casual and waistcoats, skirts, other dresses, longsleeve tops, jumpers and cardigans, jackets, gym clothes, karate gi. Shoes sit under the formal end and boots under the jumpers and jackets. Socks and tights are threatening to overwhelm my underwear drawer, I have caught them attempting to strangle helpless bras on many occasions. I also have a drawer just for t shirts and longsleeve t shirts, and a drawer for pyjamas and any other clothes that can be kept folded flat. 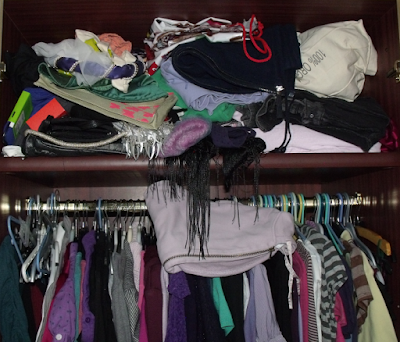 Every part of this is full to bursting and yet I constantly feel like I have so very few clothes. I need to do a MAJOR clearout.